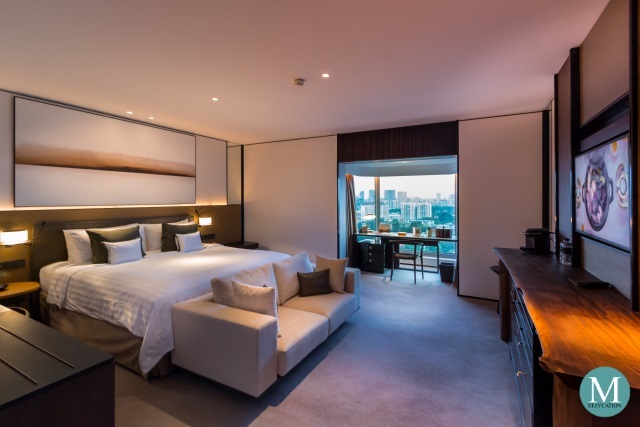 The Horizon Club Deluxe Room is the lead-in Horizon Club category guestroom of Shangri-La Hotel Singapore. Housed in the hotel's Tower Wing, the Horizon Club Deluxe Room is available in two configurations, the Horizon Club Deluxe Room and the "unofficial" Horizon Club Deluxe Corner Room (shown above). 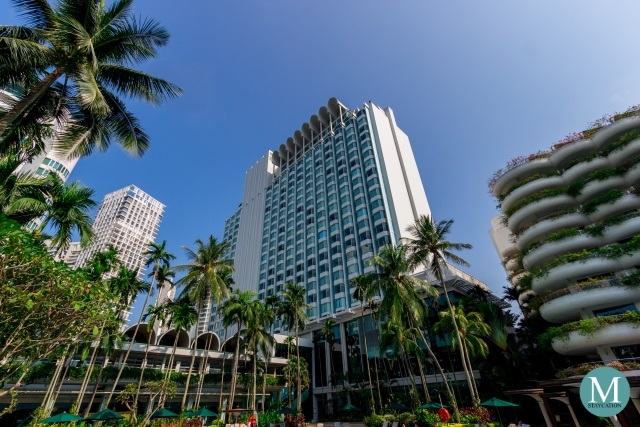 First opened in the 1971, the iconic Tower Wing of Shangri-La Hotel Singapore underwent an eight-month renovation program, with all the 503 guestrooms and suites refurbished in a modern luxury design. 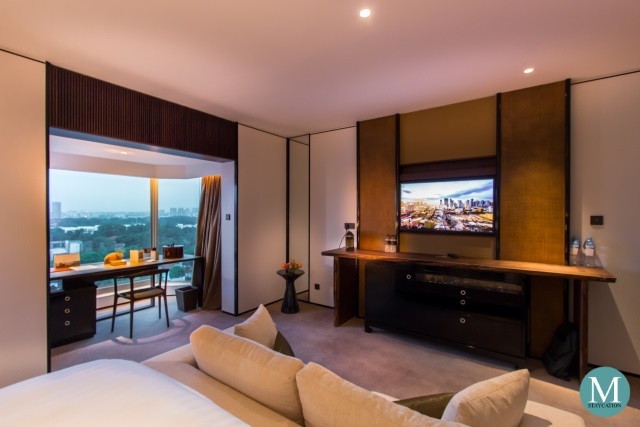 When it reopened in May 2017, the Tower Wing of Shangri-La Hotel Singapore held the distinction of the first and newest Shangri-La property in the world. Guests staying in a Horizon Club Deluxe Room can choose between a room with a panoramic view of the city or a room overlooking the hotel's outdoor swimming pool and gardens. The room where I stayed in had a view facing the city. 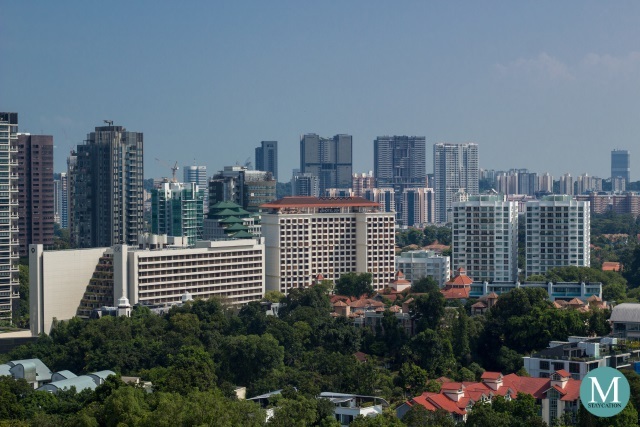 The photo above shows Hotel Jen Tanglin Singapore in the middle, the hotel where I stayed when I first visited Singapore in November 2016. 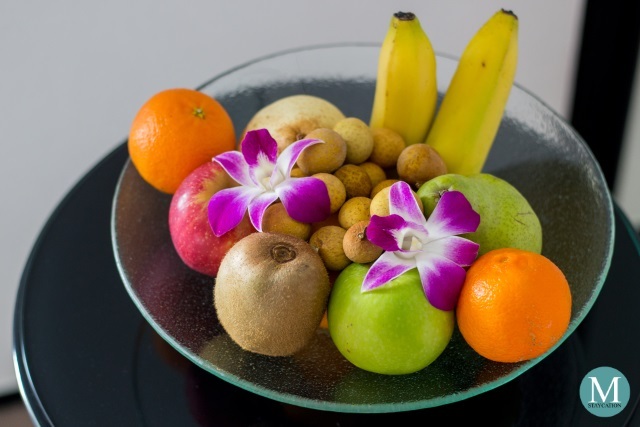 As always, guests staying in a Shangri-la property receive a platter of fruits as part of their welcome amenity. I also got a box of pralines placed on top of the working desk. Similar to my experience at Kowloon Shangri-La Hong Kong, a pot of hot jasmine tea was waiting for my arrival in my room. As mentioned earlier, the Horizon Club Deluxe Corner Room is an "unofficial" room category. If you check the hotel's website, you will only find the Horizon Club Deluxe Room category which measured 38 square meters. There is however a corner room version of the Horizon Club Deluxe Room which is more spacious. This particular room is furnished with a king bed with a quality consistent in all Shangri-La properties I have stayed in. Most importantly, the mattress had the right firmness that adjusts to the contours of the body while keeping a good support to the body weight. At the foot of the bed was a two-sitter sofa. 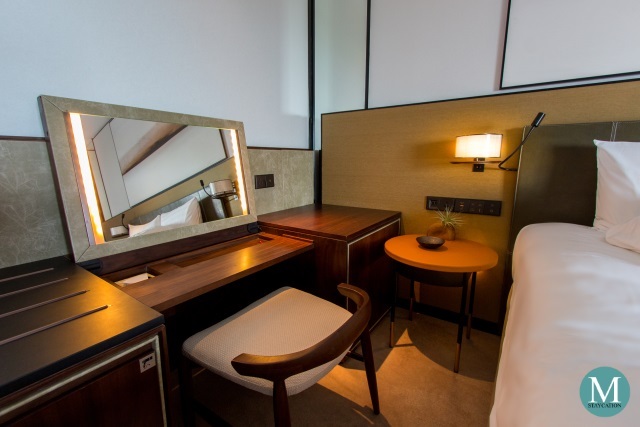 Next to the bed is a Hollywood-style vanity complete with a mirror framed on the sides with LED lights and storage space for personal articles. Next to the vanity is a spacious luggage rack. These features are unique to the corner room version of the Horizon Club Deluxe Room. I really love the layout of this room, particularly the orientation of the bed and of the sofa to the flat screen television. The room also features modern conveniences such as the control panel mounted next to the bed. It controls both the lights and the curtains. 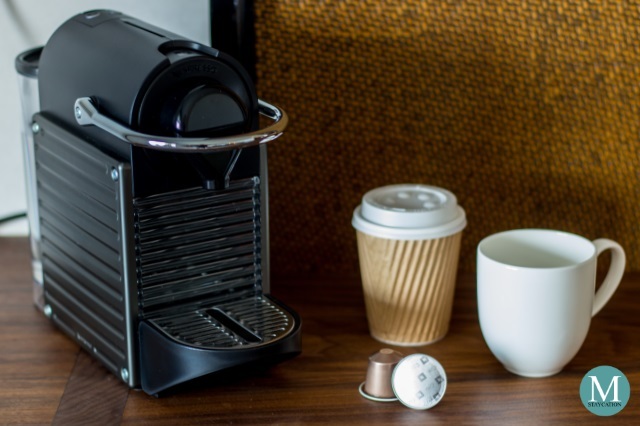 The one thing I love the most about Horizon Club category guestrooms and suites is the in-room Nespresso machine. I can't survive without coffee and there are moments when it feels troublesome to go to the Horizon Club lounge. Plus, the smell of freshly brewed coffee inside the room is pure bliss, don't you agree? 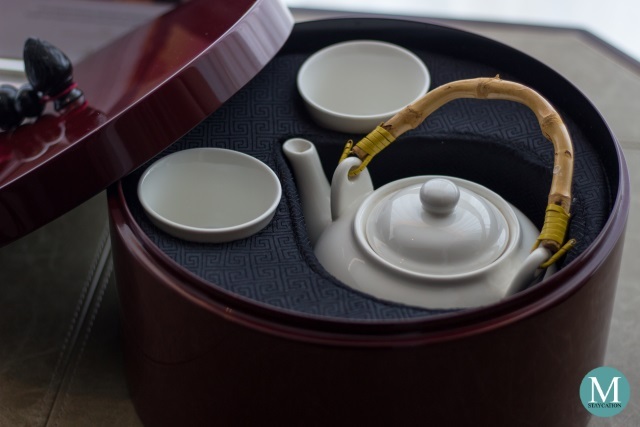 Changing the brand of their complimentary in-room tea to Zesta has been one of the best decisions Shangri-La has made. In addition to TWG, Zesta is the only brand of tea that I actually bring home with me after staying in a hotel. 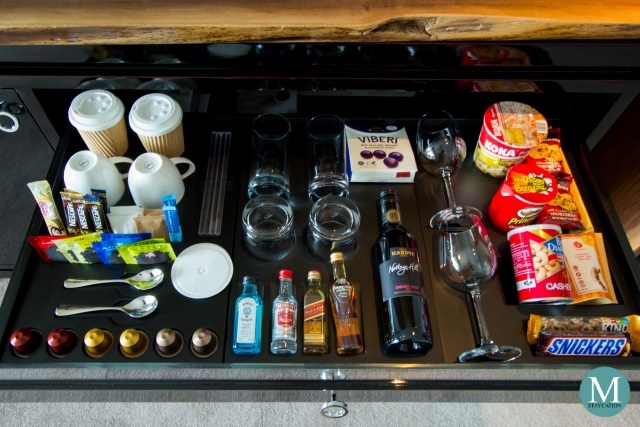 The minibar was well stocked with snacks, spirits, assorted soda drinks, bottled juices, and wine. Another unique feature of the Horizon Club Deluxe Room is the wardrobe cabinet enclosed in glass. I find this a very smart design because the glass keeps the area looking spacious. The glass cabinet also makes it easier to spot if your left something inside. Valuable items can be stored inside the electronic safe located inside the wardrobe cabinet. While the Horizon Club Deluxe Room includes a bathtub as a standard amenity, the corner room version does not have bathtub. 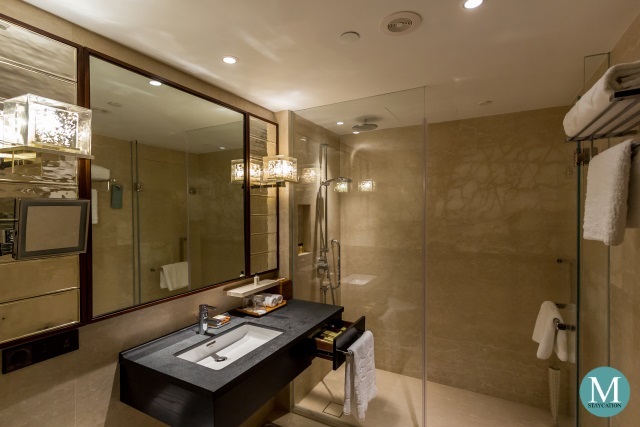 However, the layout of the bathroom of the corner room version of the Horizon Club Deluxe Room feels more spacious. The choice between a bathtub and bathroom space will depend on your personal needs and preference. The bathroom floor and walls clad with marbles. There's plenty of lighting which keeps every corner of the bathroom bright. 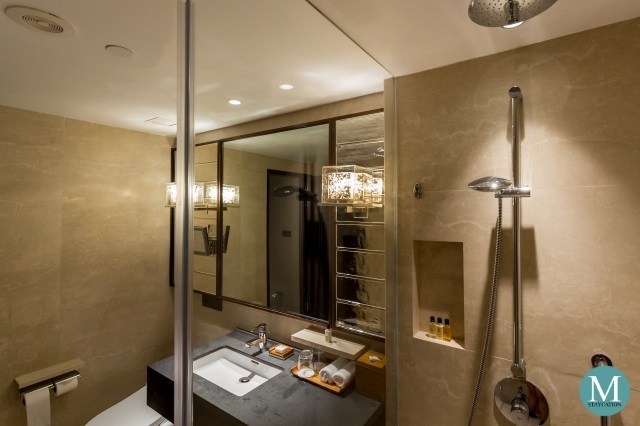 The shower area is separated used glass which keeps the bathroom feeling spacious. Fixtures and bathroom fittings are all brand new. The toilet however is not fitted with a bidet spray. My room was located on a higher floor but the water pressure was incredibly strong, consistently strong. The water temperature was also easy to regulate. 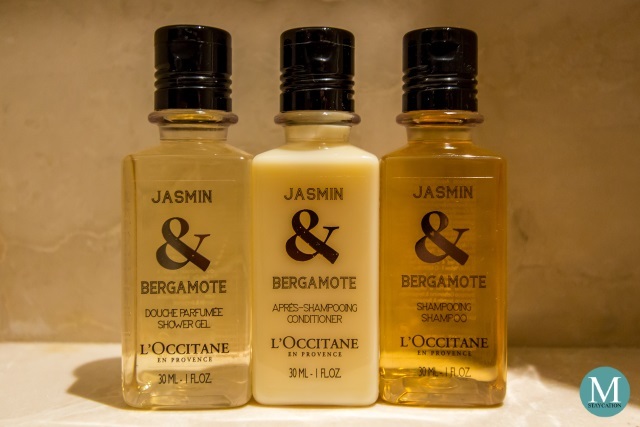 Just like in any Shangri-La Horizon Club category guestrooms and suites around the world, my bathroom was provided with Jasmine & Bergamot bath amenities from La Collection de Grasse of L'Occitane en Provence. 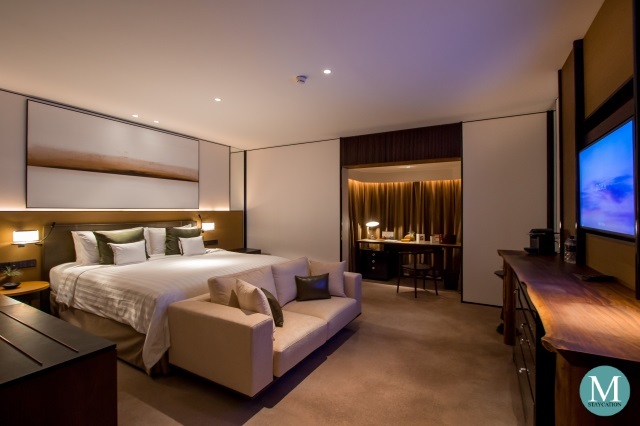 If you are planning your next staycation in Singapore, I highly recommend the Horizon Club Deluxe Room. The corner room version is ideal for couples and young families. 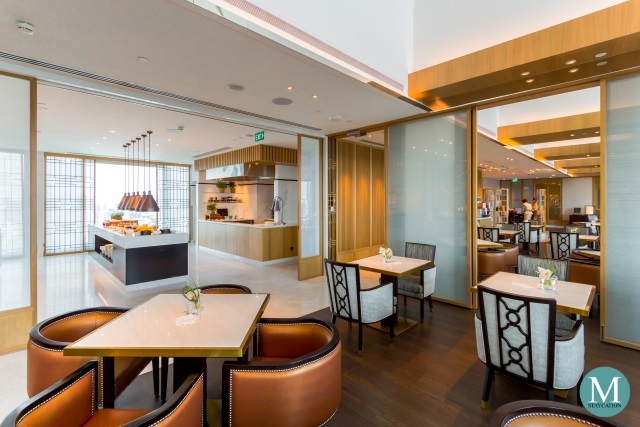 Business travelers will definitely enjoy the access to the Horizon Club Lounge which is an ideal venue to meet business partners and clients.